It is no surprise that Eileen Kathryn Boyd is one of New York’s most influential interior designers. Her eclectic style and impeccable taste leave each of her design projects undeniably brilliant. Eileen Kathryn Boyd attended the Rhode Island School of Design Summer Program. She continued her design aesthetic by studying at the Cleveland Institute of Art and then the prestigious Parsons School of Design where she graduated with a BFA in Environmental Design. During her time at Parsons, Eileen was able to study abroad at the American College in Paris. Eileen later propelled her career forward by becoming one of the leading designers for Falcon Jet, in which she impressed her colleagues with extraordinary aircraft interiors for some of Falcon’s most high-profile private jet patrons. With over 20 years of experience, Eileen offers careful consideration to her upscale clientele, paying close attention to both function and beauty. She is very aware of geometry and scale, enabling her to get just the right proportions -- resulting in perfect harmony. Perhaps, the best way to recognize Eileen’s magnificent work is to refer to her intricate yet bold use of color. Decorating with color is often the antidote to breathing life into a dark-drab space, and her intriguing interpretations do just that! She is able to effortlessly blend traditional as well as modern elements into a space, further highlighting her inspiring imprint on interior design. Her pioneering color-story philosophy has earned her a proceeding reputation as a leading innovator within her field. Eileen’s design expertise has been featured throughout the media in various outlets such as, Traditional Home, 1st Dibs, Coastal Living, Home, Woman’s Day, Family Circle, Elle Décor, Time Out NY, Newsday, Decorati, Martha Stewart Radio, and many others. 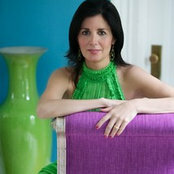 Eileen is also a member of ASID & IFDA. Comentado: FabricYou can buy here thru my studio…please call here at 631.427.6400…Thanks! Comentado: What a beautiful accent wall! Are these framed silk fabric panels? ThxThanks so much for your interest. The panels are not silk but a composite paper product which is actually peel and stick! Comentado: Is there information available regarding the lamp of the right?So sorry but we have no information about the swing arm lamp in the photo. Wish we could help!